Koffee Kult doesn’t believe in settling for ordinary when you can have the very best. That’s why we roast premium coffee beans from around the world that create simply delicious coffee to cater to the overwhelming growth of coffee cults, boutique coffee shops, and every day worker’s start to their day. Koffee Kult acquires beans from quality growers in more than 50 countries around the world that harvest coffee. We maintain the highest standard of excellence, roasting the highest quality and grade of Arabica beans from Indonesia, Central and South America, and Africa. 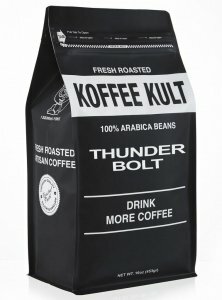 Koffee Kult supplies small batches (30 pounds) of artisan roast beans to many of South Florida’s coffee and espresso bars. Coffee Cults are sweeping the nation, and South Florida sees new coffee shops opening up on every street corner, giving competition to major brand competitors. As a supplier of some of the very best coffee in the world, Koffee Kult supplies these boutique coffee shops with the highest quality of coffee beans to beat the competition. Our Roaster Master carefully hand-selects all the green beans for roasting, taking care to preserve flavor nuances and ensure correct development for each batch that leaves his roaster. The roastmaster also personally oversees the hand-packaging of our coffee varieties after roasting to be absolutely certain there are no bean defects.